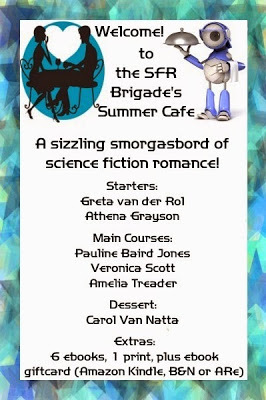 The SFR Brigade has been a hub for readers and writers of SciFi Romance for several years. This summer they are organizing a six week long blog hop event. Each week a different group of SFR authors representing different sub-categories will post on the them of recipes, not always for food. There are fun posts to read and prizes to be had each week. It’s Week One and the menu card for the week serves up some stellar SFR Space Opera: starters are shorter length stories, the main courses provide something more substantial, and desserts give you a sweeter finish. You’ll also find this week’s prize bundle listed under extras, and all the prizes on offer are space opera themed. One winner will be chosen by rafflecopter at the end of the week (and the rafflecopter only appears on the participating blogs). To visit the participants in the space opera menu, follow the links below. Show your appreciation at each with a little comment love and it might win you some extra goodies too! This is a great way to check out new SFR authors, so go and have fun! And good luck on the prizes!